Anyway, I've also been lucky enough to find a few folks interested in reading about my market adventures. Summer Tomato, a food-health-all-around-nifty-blog out of San Francisco, is one of them. Discovered in the course of the 2010 Blogathon, it's become a regular read. 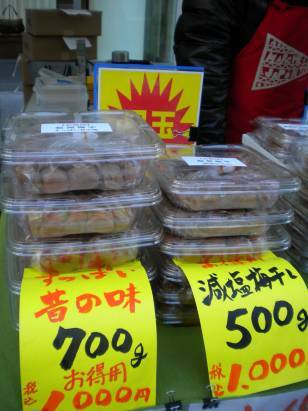 I wrote about Tokyo's United Nation's University Market in October (one of a number of markets in the city, by the way); the Dane County Farmer's Market in February, and now Osaka's Odona Market can be added to the list. P.S. My dearest assistant is working up a video of our visit to the Odona Market, too, so get your popcorn ready!